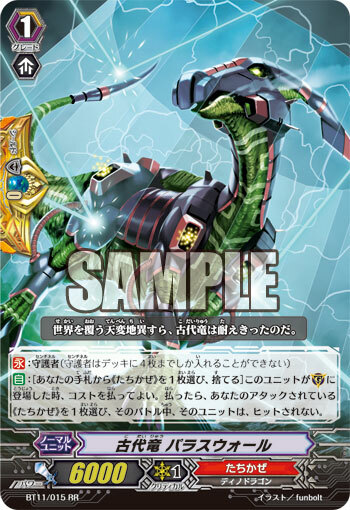 [AUTO](VC) Limit Break 4 (This ability is active if you have four or more damage):[Counter Blast (2) & Soul Blast (2)] When an opponent’s rear-guard is put in the drop zone by any of your card’s effect, you may pay the cost. If you do, draw a card, choose one of your opponent’s rear-guards in the front row, retire it, and this unit gets [Power]+5000 until end of turn. 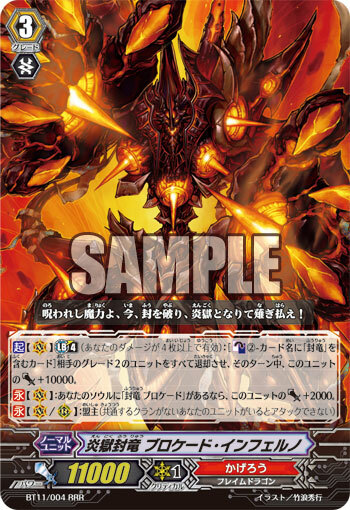 [AUTO]:[Choose one of your rear-guards with « Eradicator » in its card name, and put it into your soul] When this unit is placed on (VC), you may pay the cost. If you do, choose one of your opponent’s rear-guards in the front row, and retire it. One of the Squad Commanders of the « Eradicators » in Narukami, one of the two great pillars of the imperial military. Clad in vivid armor and carrying an almost alien sword, he has a body that’s more than 30 meters long, resulting in an appearance that draws attention to him, no matter what. Without running counter to his appearance, he’s a broadminded warrior, but he’s an old-fashioned sort who believes that « improving the men’s morale » is the way you win a war. It seems the arrival of this flashy, awe-inspiring commander motivated something inside the soldiers, something about him, the showy way he dresses, or maybe the way he fights, it inspires all of his comrades, and it’s all done in the name of victory for the empire. His roar reaches to far beyond, making the enemy cower, while his men charge faster and harder. The moment that explosive battle cry hits the ears of the enemy, it starts a countdown of the time they have left on this mortal coil. 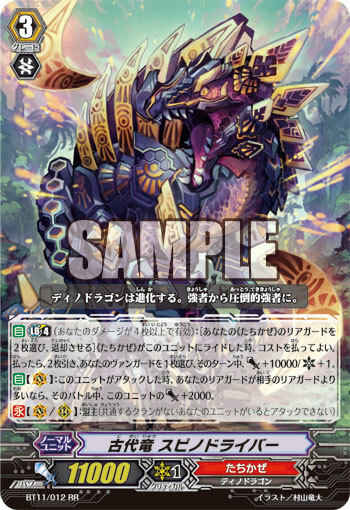 [AUTO]:[Counter Blast (1) – Cards with « Seal Dragon » in its card names] When this unit is placed on (VC) or (RC), if you have a «Kagero» vanguard, you may pay the cost. If you do, choose one of your opponent’s rear-guards, retire it, your opponent look at up to four cards from the top of his or her deck, searches for up to one grade 2 from among them, calls it to (RC), and your opponent shuffles his or her deck. The generic term for the dragons who have been sealed and imprisoned by the direct order of the Emperor for various reasons. The degree and means of sealing are different than that of Dungaree. They are housed and imprisoned in a vast prison deep underground called the « Magma Prison », under direct supervision, with twice as many locks and seals as normal criminals. However, in order to counter the invasion of « Link Joker », several warriors were discharged from the prison temporarily and allowed to fight, with some of their seals weakened. As well, the stage of the seal is different which each convict. 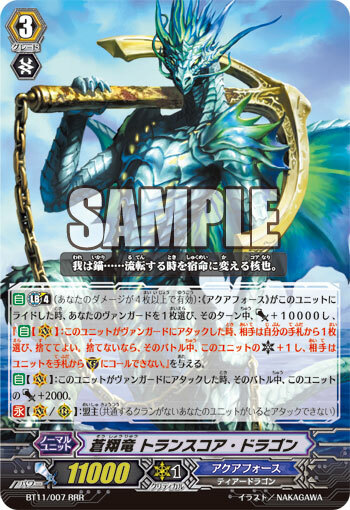 [ACT](VC) Limit Break 4 (This ability is active if you have four or more damage):[Counter Blast (2) – Cards with « Seal Dragon » in its card name] Retire all of your opponent’s grade 2 units, and this unit gets [Power]+10000 until end of turn. 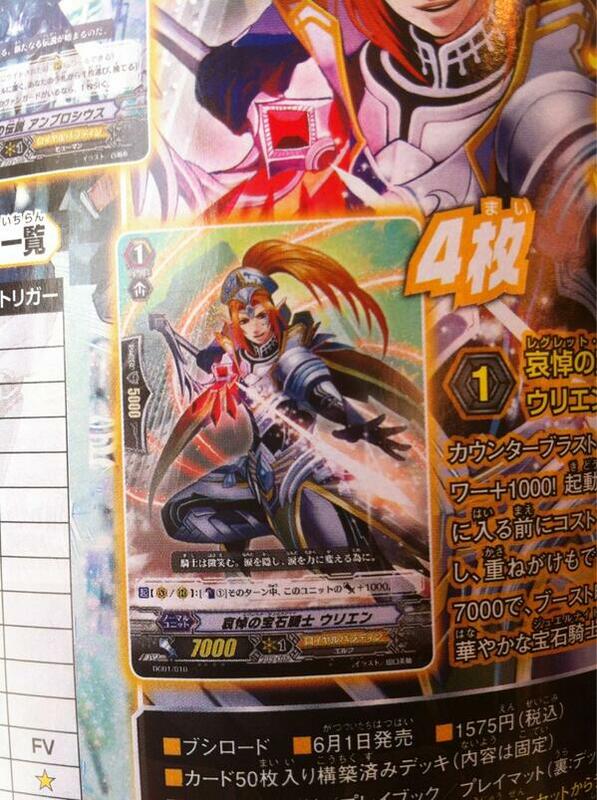 [CONT](VC):If you have a card named « Seal Dragon, Blockade » in your soul, this unit gets [Power]+2000. In order to prevent further madness from the Invaders, « Blockade » was allowed to unleash the power of his true form. Super hot flames constantly eject from gun ports all over his body, which is actually his surplus energy gushing forth, because it could not be converted into heat. His « Vanishing Field », which was his ace-in-the-hole while in his Sealed Form, is now constantly active, which should give you a clear idea of his true power. In addition, while it’s never allowed to be used in times of peace, he has a trump card: « Inferno Devastation », where he releases all the heat inside his body. Old generals from the Empire’s top brass objected until the end, arguing his existence is so horrible that almost none of the other « Seal Dragons » can match up to him, which is the reason after so many twists and turns, it took so long for his seal to be broken. The master of the Burning Hell is considered to be a walking natural disaster just by existing, that even the strongest generals in the Empire tremble in terror from just hearing his name. The uncontrollable cursed magic now burns down the heavens that have been invaded by darkness. [CONT](VC):During your turn, your opponent’s units cannot intercept. A dragon warrior of « Kagero » who obtained incredible power, but because of it, had that power sealed away. It should be noted that his entire body is wrapped up in sacred sealing clothes that block his power, but he remains proud of that power, continuing to fight on the battlefield to make sure he can use it. He has learned an incredible skill called « Vanishing Field », that temporarily breaks the seal put upon him by unleashing the magical power pooled up inside him. Since everything around him is consumed in a storm-like vortex of flames when he uses this ability, it’s said that those who catch sight of him breaking the seal don’t survive. Although he is absolutely, unconditionally loyal to the Empire and Emperor, he harms everything he cares for due to the incredible power he can’t hold back. He contently accepts the disgrace of his power being sealed, it is a punishment for himself, due to his inexperience of controlling his own power. 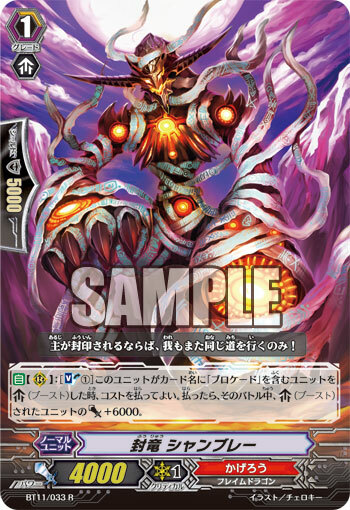 [AUTO](RC):[Soul Blast (1)] When this unit boosts a unit with « Blockade » in its card name, you may pay the cost. If you do, the boosted unit gets [Power]+6000 until end of that battle. One of the Seal Dragons that was allowed to return to the surface temporarily, if meant that they could gain any advantage over the invaders. He had his power sealed not because of a power he couldn’t control, but because he is the servant of « Blockade ». Because he was born without being blessed with power, he admired « Blockade », who came from the same hometown as him, for being declared the strongest warrior of their clan, and became his lone servant. He researched every form of ventilation and control that existed, so his master could control his magical power, but in the end, « Blockade » was labelled a dangerous entity, despite all his hard work. As a result, he avoided being imprisoned, but from then, up to even now, he placed a first grade seal on his own body that stole most of his own power. Following his master and becoming a Seal Dragon, he has become very aware of the horror and usefulness of this power called « seals », and resumed his research. He will never give up. Not until the cursed dragon can exist in the world, accepted and unsealed. Et voici notre vague d’informations du mois ! Petite cependant, car elle sera centrée sur le Special Set Daigo et révèlera l’effet de l’ace du TD10 : Purgatory Revenger ! And here is our wave of information of the month ! A small one though as it is centered around the Daigo’s Special Set, and will reveal the TD10 : Purgatory Revenger’s ace Unit ! [AUTO]:[Counter Blast (2)] When this unit is placed on (VC) or (RC), if you have a vanguard with « Revenger » in its card name, you may pay the cost. If you do, choose one of your opponent’s rear-guards in the front row, and retire it. 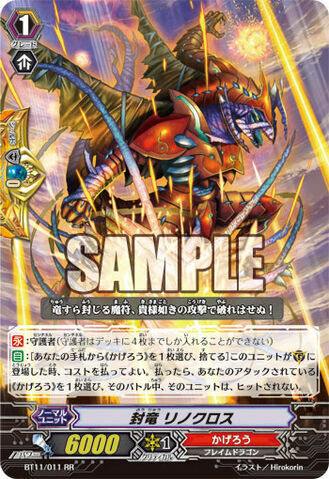 [AUTO](VC/RC):[Counter Blast (2)] When this Unit’s attack hits the vanguard, if you have a «Royal Paladin» vanguard, you may pay the cost. 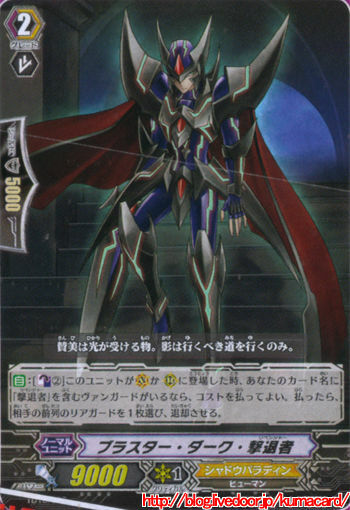 If you do, search your deck up to one grade 1 or less «Royal Paladin», call it to (RC), and shuffle your deck. 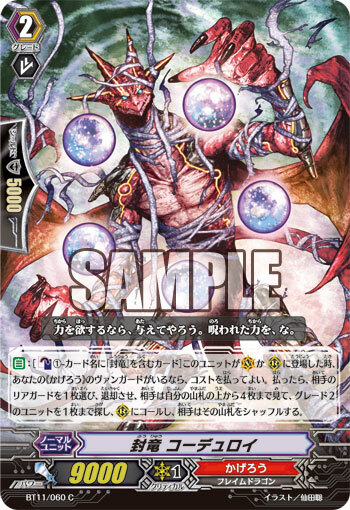 [AUTO](RC):[Soul Blast (1)] When this unit boosts a unit named « Sanctuary Guard Dragon », you may pay the cost. If you do, the boosted unit gets [Power]+5000 until end of that battle. 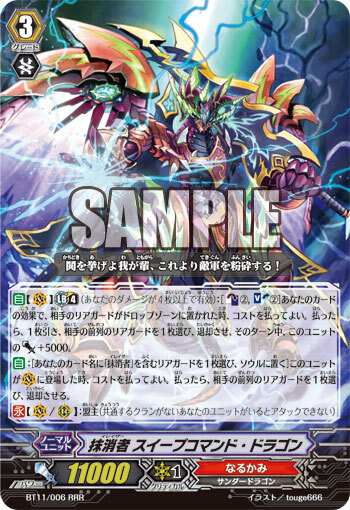 [AUTO]:When this unit is placed on (RC) from your deck, if you have a «Royal Paladin» vanguard, this unit gets [Power]+3000 until end of turn. [AUTO]:[Counter Blast (1)] When this unit is put into the drop zone from your soul, if you have a «Genesis» vanguard, you may pay the cost. If you do, call this unit to (RC). A Witch of « Genesis », who is the most skilled at collecting information. She is a master of « Resonance », which fill machines and animals with a sort of other self, allowing her to hear what they hear and see what they see. 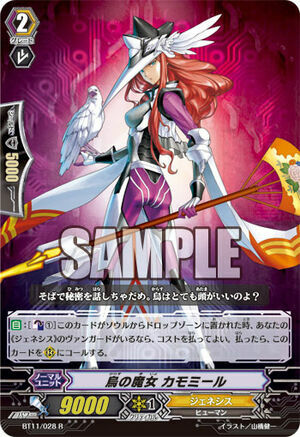 Most users of Resonance can only resonate with one creature at a time (be it Mythical Beast, mechanical animals, or some sort of Spirit), she boasts the ability to control the senses of multiple creatures at a time, resonating with dozens of creatures at once. In this age of modern warfare where a 1 KB file can change the tide of battle, She is said to be able to get the same amount of classified information a group of 10,000 soldiers would typically be needed to acquire. She also steals classified information using telepathy, while using it to instigate anxiety and spread false information among enemy ranks… … In the backstage of the battles where soldiers clash swords, spilling blood, there are brutal wars over the flow of information that the witches are always fighting. A witch of « Genesis » who serves the minor goddess « Heqet ». She is called the Frog Witch due to being a messenger of the frog-like goddess « Heqet », along with using mechanical frogs built in her image. Her chief form of magic is Cray’s form of Kotodama: Spirit Words, which is essentially magic placed in her words, giving shape and substance to whatever she says. However, she doesn’t have the magical power or resources to create anything *too* complex or an event that’s *too* bizarre. A user of Spirit Words values words more than other people would, because of the shape of their magic. You should pay attention when talking to her, to make sure you don’t use any funny words or use words in the wrong way. 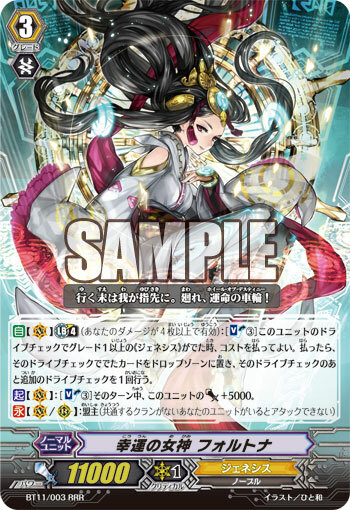 [AUTO] Limit Break 4 (This ability is active if you have four or more damage):When a «Aqua Force» rides this unit, choose one of your vanguard, that unit gets [Power]+10000 and « [AUTO](VC):When this unit attacks a vanguard, your opponent may choose a card from his or her hand, and discard it. If your opponent does not, this unit gets [Critical]+1, and your opponent cannot normal call units to (GC) until end of that battle. » until end of turn. A Rear Admiral in « Aqua Force » who woke up at the same time the invaders, well, invaded. His Combat Skills. As the Division Commander of the Navy’s Seventh Division, he has attracted those specializing in hand-to-hand combat, and is quite adept at using one of the Hydro-Energy (HE) Weapons: « Doom’s Anchor ». However, he’s a quiet guy with a very taciturn way of speaking, but when he has to talk, what he says is something incredibly persuasive. In the past, he worked directly under « Maelstrom », so he earned Maelstrom’s trust, and as a result, he was sent to the battlefield as a part of the front line when the Invaders came. He’s been compared to an Anchor, in that he’s « Impassable » and « Unmovable ». He’s a unbeatable Draconic Warrior who refuses to be swept up by the currents of fate. With his unbending and unwavering will, he may be the lynch-pin needed to stop Cray from falling into an unprecedented crisis. 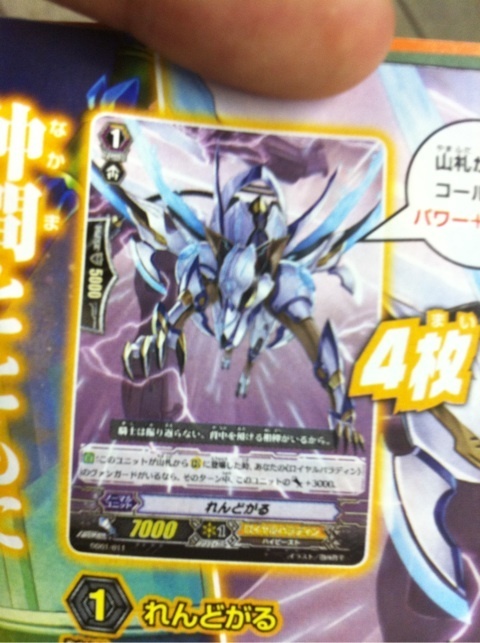 [AUTO] Limit Break 4 (This ability is active if you have four or more damage):[Choose two of your «Tachikaze» rear-guards, and retire them] When a «Tachikaze» rides this unit, you may pay the cost. 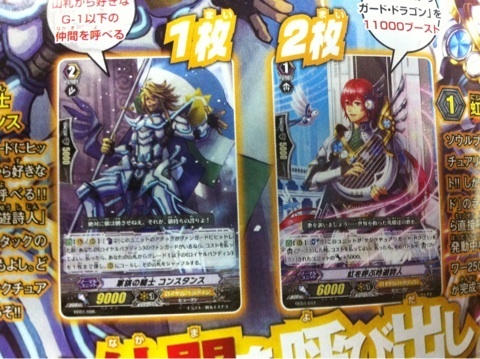 If you do, draw two cards, choose one of your vanguards, and that unit gets [Power]+10000/[Critical]+1 until end of turn. [AUTO](VC):When this unit attacks, if the number of rear-guards you have is more than your opponent’s, this unit gets [Power]+2000 until end of that battle. A Dino Dragon known as an « Ancient Dragon », one of such that flourished in pre-historic times. The earliest of the Ancient Dragons to awaken, it evolved during its slumber by mutating its scales to become incredibly hard and sharp. While most of its body became rock-like armor that deflects bullets, certain amber scales, in particular, enlarged and became like blades that could cut through even metal. He also learned the language of the modern Dino Dragons almost instantly after awakening. While the soldiers and scientists were shocked by the incredible learning speed, an innate sign of the sheer ability of the Dino Dragons, the commanders and generals were quite giddy. With this Super Ancient Legacy, they could twist the fate of their own destruction. With them, they could decide to not give into a fate of despair. The Dino Dragons that conquered the continents of Cray in ancient times. While other species were killed one after another by the fury of natural disasters, they decided to enter a deep hibernation, surviving at the bottom of the Earth. As well, their abnormal life force somehow exerted itself, causing them to continue to evolve, even as they slept. It is theorized they awoke due to contamination to the planet’s continents and atmosphere, due to the invasion of Link Joker. 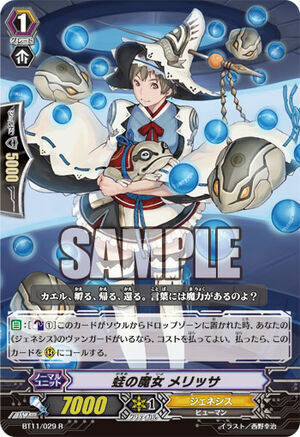 [AUTO]:[Choose one «Tachikaze» from your hand, and discard it] When this unit is placed on (GC), you may pay the cost. If you do, choose one of your «Tachikaze» that is being attacked, and that unit cannot be hit until end of that battle. One of the « Ancient Dragons », a breed of Dino Dragons that thrived in Prehistoric times. Since the Ancient Dragons evolve based on what they know about their enemies, while many develop external changes, this one in particular was a rare case, in that he evolved an organ that generates electromagnetic waves. The electromagnetic waves generated by this organ can be amplified by external organs, creating a powerful electromagnetic shield around itself. While its range is limited, it’s said to be strong enough to repel dozens of magical blasts from even the strongest witches, and is incapable of being broken by constant assaults from rank-and-file infantry. They continue to evolve even now. Don’t be surprised if an attack that worked yesterday doesn’t work tomorrow. 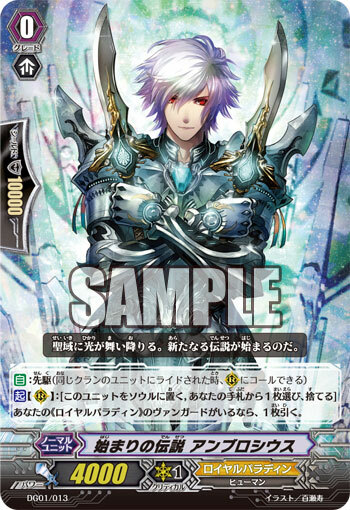 [ACT](RC):[Put this unit into your soul & Choose a card from your hand, and discard it] If you have a «Royal Paladin» vanguard, you may pay the cost. If you do, draw a card. A legendary hero whose name was left in records from before the White Dragon King’s reign. Although he is the founder of the Holy Nation, he is someone who left very little traces behind, and because witnesses failed to agree on his appearance, his very existence is considered suspect. There are some theories that because Ambrosius disappears from the annals of history at the same time the White Dragon King appeared, but no proof supports this. In the present day, his crimson pupils and crystal-like hair he is known for were never actually mentioned in testimony by ancient soldiers, and is thought to be the result of the imagination of the renowned painter who drew his portrait for the royal palace. He is an important figure in history whose true shape has been lost. By nature, one could say being a Hero means someone whose existence swings between truth and legend. 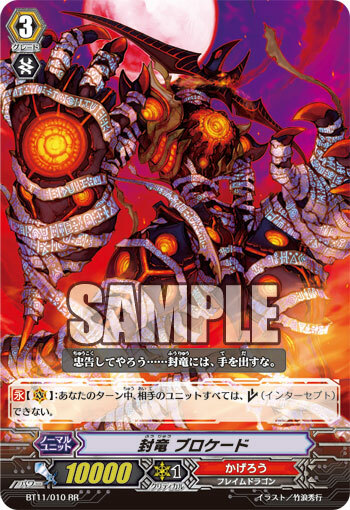 [AUTO](VC) Limit Break 4 (This ability is active if you have four or more damage):[Soul Blast (3)] When this unit’s drive check reveals a grade 1 or greater «Genesis», you may pay the cost. If you do, put that revealed card into your drop zone after of this drive check, and perform an additional drive check. One of the oldest soldiers in the empire who has been around since the time of the First Emperor. Desiring to become stronger than anyone else, even though he is a passionate dragon warrior, as the years pile themselves on top of him, he grew weaker. So, he chose to retire to the sacred mountains at the age of 4000, and sealed his body away. However, this seal was shattered by the appearance of an unexpected group of visitors called « Link Joker ». 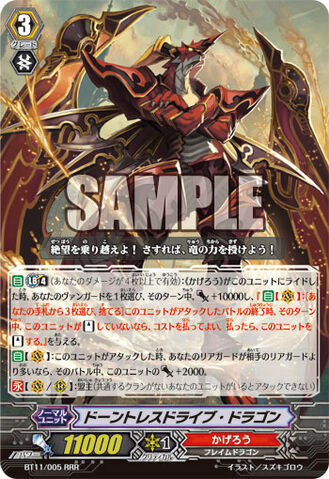 After awakening from the attack, and having been kicked about by the invaders’ vanguard team, this tenacious dragon, with the title of « Dauntless Drive », was assigned to « Kagero ». The fighting spirit of this ancient general continues to fire up the spirits of those who would waver. Someday soon, the invaders will be sorry. That they awoke the immortal soldier who fears not despair. One of the « Seal Dragons » allowed to return to the surface to fight back against the invaders. In the past he served as a soldier and researcher, constantly experimenting with forbidden, dangerous magic without safety proofing the surronding area, he ended up causing immense damage to the army, and was locked away with a Class 2 Seal, freezing all of his magic. With the magical seals applying hardening magic and the sacred seals wrapped around him counteracting any sort of magic, he has become resistant to nearly any attack. And while the seals sharply reduce his magical power, he’s still a deft warrior who can easily adjust to fighting however he needs, regardless of the circumstances. However, he still has a number of insidious schemes running through his head, willing to hurt his fellow countrymen to satisfy his lust for knowledge. But though his insidious ambitions have not yet been quelled, for the moment, he’ll use his skills for the Empire.